Sarasota is a sunny city located on the southwest coast of Florida. Sarasota is nationally acclaimed for its beaches, resorts, culture, and architecture: the famed Ringling Museum and the Sarasota School of Architecture are both located in the city, where they are frequented by locals and visitors alike. Furthermore, the diverse art culture in the town extends beyond the museum to include many reputable theaters, concert venues, and sculptures scattered throughout the area. Sarasota locals take pride not only in the artistic community, but also in the breathtaking beaches and nature areas surrounding Sarasota Bay. Though enjoyable, these beaches come with high temperatures and humidity levels that take a toll on the surrounding living and working structures. These and other Florida staples such as harsh environmental conditions and intense amounts of rainfall can cause foundational problems, sinkholes, and seawall erosion, and in the presence of these problems, Solid Foundations offers its professional foundation repair, sinkhole remediation, and seawall repair services to Sarasota, Florida. The constant wind, water, and weather in Sarasota, Florida, create the need for the foundations of regional homes and businesses to be able to endure an excess of stress. Unusually high temperatures and humidity levels tend to bring problems such as mold, musty smells, insect infestations, buckled hardwood flooring, and condensation on pipes and insulation to Sarasota homes. More serious problems that also occur quite frequently in environments similar to that of Sarasota include excessive hydrostatic pressure, cracks in slabs or foundations, plumbing leaks, and sinking foundations. In order to prevent complete foundation failure, contact the Sarasota foundation repair professionals of Solid Foundations at the first sign of any trouble with your foundation. Stay alert and aware of any signs of foundational or structural problems, such as cracks in your walls, floors, concrete slabs, garage columns, and chimneys. Other signs to spot include doors, cabinets, and windows that stick and do not close properly; stairways that are pulling away from the foundation; and even leaning homes. If any of these issues arise in your home or business, call Solid Foundations immediately for our Sarasota foundation repairs. Solid Foundations uses a variety of resources in order to provide the most effective and valuable foundation repair services to the Sarasota area. For Sarasota foundation repairs, our foundation repair and underpinning solutions include steel push piers, helical piers, wall anchors, cement grouting, and polyurethane resins, and our Grip-Tite® piering systems come with lifetime transferrable warranties. The use of these effective tools allows Solid Foundations to lift, level, and support your Sarasota home or business above inferior underground conditions. Rather than relying on shifting and settling soil for the security of your home, rely on the expert Sarasota foundation repair services of Solid Foundations. Six states in America feature frequent sinkhole activity, but that state of Florida has the highest recorded number of sinkholes in the country. The geological foundation of Florida contributes greatly to this fact. The acidic rain that flows through the ground easily corrodes the porous limestone bedrock upon which Florida is built. As the acidic water carves a path through the limestone, it wears away the lower layers until only thin upper layers remain. On the brink of collapse, these thin layers readily form sinkholes when disrupted by just the right amount of pressure. When you notice any of these indications of sinkhole activity around your Sarasota home or business, call Solid Foundations. Our experienced professionals will inspect the situation and solve all of your sinkhole related problems. We employ our cement grouting solutions to fix your sinkhole properly; these solutions include compaction grouting and void filling, guaranteed ways to stabilize the soil and erase any voids that may induce the creation of a sinkhole. Our Sarasota sinkhole repair methods allow the communities of Sarasota, Florida, to freely and safely enjoy their town. Bays, waterways, and other bodies of water wet the Sarasota landscape and present the opportunity for locals to live on waterfront property. In order to appreciate the beauty of the water from a healthy distance, waterfront properties depend upon seawalls to keep them high and dry, but these seawalls cannot fulfill their purpose perfectly forever: constant battering beneath the harsh elements of the ocean can cause speedy and worrisome deterioration. Eventually, seawalls in Sarasota, Florida, can begin to crack, sink, rotate, or bulge, occurrences that can lead to the total failure of the seawall. While the idea of seawall failure is scary, locals have nothing to fear when they trust in Solid Foundations for their Sarasota seawall repairs. Solid Foundations uses many trusted techniques when addressing the problem of seawall repair, including our Targeted Grout Injection, which plugs the leaks and penetrates the underground voids that are threatening your wall. The Targeted Grout Injection process uses hydrophobic grouts that are able to fill holes, repair leaks, and stabilize soils even in the watery environments around seawalls. Solid Foundations has years of experience supplying high quality seawall repairs to Sarasota, Florida, and we intend to serve the people of this pleasant seaside town for years to come. 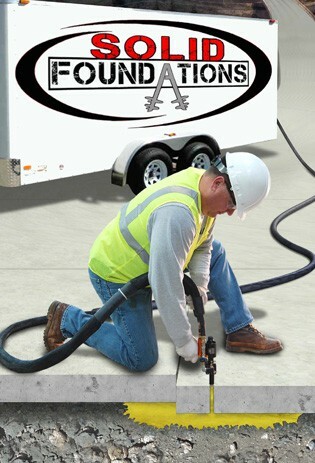 Solid Foundations solves the problems of the residents of Sarasota, Florida, not only with our foundation repair, sinkhole remediation, and seawall repair services, but also with our void filling services, pipe and structure leak repair, French drain installations, soil stabilization services, and more. No matter the structural complications Sarasota residents may experience, Solid Foundations can put Sarasota, Florida, back on solid ground. Call us today for your Sarasota foundation repair services!